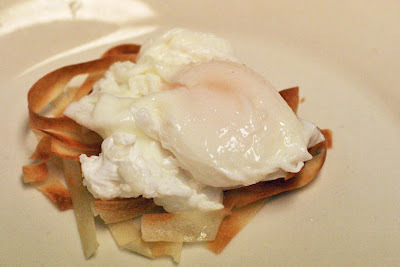 I love soft-boiled eggs, or, more specifically, the just-underdone whites of an egg. (With salmonella being a very real but very remote danger of jiggly eggs, and restaurants having an aversion to serving them that way, I'd never eaten one that way until I accidentally underdid a pot of hard-boiled eggs.) 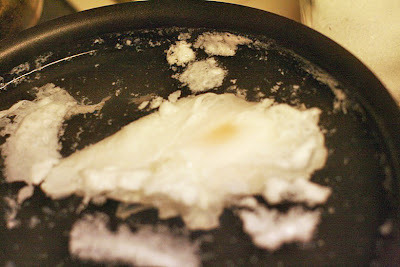 I also found out that's how poached eggs have traditionally been cooked. 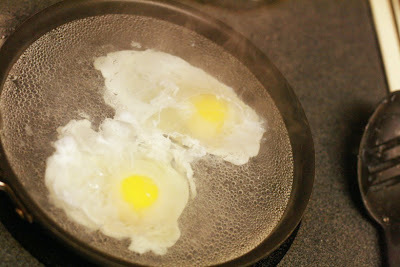 Amanda nor Corin likes eggs, so I don't make them often, but when I do I like to poach up an egg. 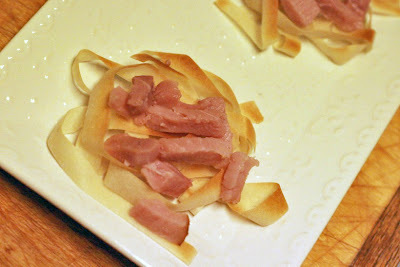 This particular recipe is the result of wanting to add something to accentuate the egg, and getting a little bit cheeky: a "nest" made of strips of baked spring roll wrapper. 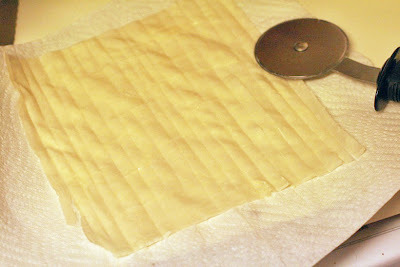 1) Very lightly butter the spring roll shell, then cut into strips using a pizza cutter. 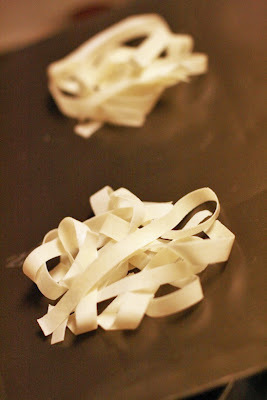 2) Make two nests on a cookie sheet by peeling apart the strips and then bunching them together. 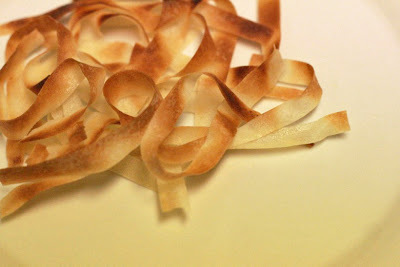 3) Broil in the oven for 1-3 minutes until the tops turn brown (they go black quickly, so watch them carefully). 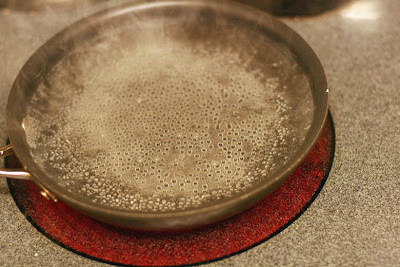 4) To poach your eggs, bring a small saucepan filled with water, vinegar, and salt to a rapid boil, reduce heat to a strong simmer, and then crack your two eggs directly into the hot water. 5) Watch the eggs closely, and in 2-4 minutes when the top has almost but not quite closed over, use a slotted spoon to remove the egg, draining the water off before placing each on a nest. 6) Salt to taste and eat immediately. 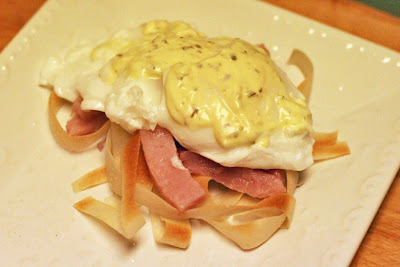 Optional: You can easily turn these into eggs benedict nests by adding warmed strips of canadian bacon or ham to the nests, and spooning some béarnaise sauce on top of the egg.